Was He Really the "First European"? "Mass Migration of Aryans from Russia Contributed a Lot to the Genetics of Europeans"
"New Genetic Study of UK Shows 10,000 Years of Immigration"
that it was not until about 5800 years ago that light-skin genes, as well as other genes for blue eyes and blonde hair, started to show up at a high frequency among the inhabitants of Europe. that mass migration of Bronze Age pastoralists from southern Russia contributed up to 50% of ancestry in some north Europeans. that the genetic make-up of the "people of the British Isles" has barely changed since 1400 years ago. So, how is the cultural Marxist media handling these discoveries on the genetic history of the peoples of Europe? In this essay we will see that the mainstream media is willfully distorting the scientific content and political implications of these findings, all of which corroborate the long standing, but currently prohibited, argument that Europeans are a people with a strong racial identity based on genetic traits with a unique evolutionary history inside the continent of Europe. Now, before I get into media distortions, something needs clarification regarding the way the racial and cultural term "European" is being used by all sides in this debate. The general wording in respect to the evolution of white skin, to start with, has been along the lines of "when or how Europeans evolved white skin". But the more accurate heading would have been: "when or how the inhabitants of Europe became European." Europeans emerged in time from a preceding people that were not European. This evolution, of course, was not simply a matter of when they evolved white skin; there were a number of other key traits, which did not emerge at once but through time, which means that it is difficult to state with any definiteness exactly when the inhabitants of Europe became "European". The question is not when Europeans evolved x or y traits, white skin or lactose tolerance, since this way of framing the issue supposes that the inhabitants of Europe were European when Homo sapiens sapiens arrived in this continent some 45,000 years ago. We need to think of Europeans as a race that evolved through thousands of years inside Europe in response to the unique ecology of Europe and in response to their own unique cultural activities. The upper Paleolithic peoples who first inhabited Europe, coming from Africa via the Near East, were not Europeans but a people still closely descended from the African Homo sapiens sapiens who left Africa some 50,000 (or 60,000 years ago) and which long retained many African genetic traits. To this day, it is common to identify the Upper Paleolithic of Europe peoples, point blank, as the "first Europeans", the "original Europeans of Europe". 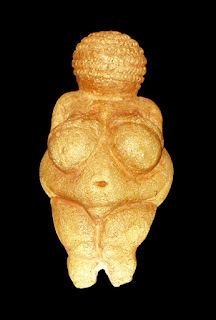 But the succession of European cultures witnessed during the long Upper Paleolithic epoch, the Aurignacian, which lasted from 45,000 to 28,000 ago, the Gravettian, which lasted from 28,000 to 21,000 years, best known for the Venus figurines, and the Solutrean, which lasted from 21,000 to 16,500 years ago, are best identified as creations of racial peoples evolving into European peoples. Why should this qualification, narrowing and precising of the term "European", be unacceptable since there is now strong evidence demonstrating that the ancestral Homo sapiens sapiens migrating out of Africa and moving into Asia and Europe, then Australia and America, continued to evolve independently in each continent in response to different environmental/cultural pressures and the random effects of genetic drift? What is a "race" if not a people that evolved certain anatomical and behavioral traits by reason of breeding for thousands of years within a geographical area relatively isolated from other evolving/isolated races? Below are a number of pictorial representations, very rough but based on recent drawings, archaeological findings and reconstructions, found in the internet, on the evolving race of Europeans. Keep in mind that these pictorial images bring out what are known as "surface differences" in racial characteristics related to skin color, shape of nose and eyelids, hair and eye color. 1. 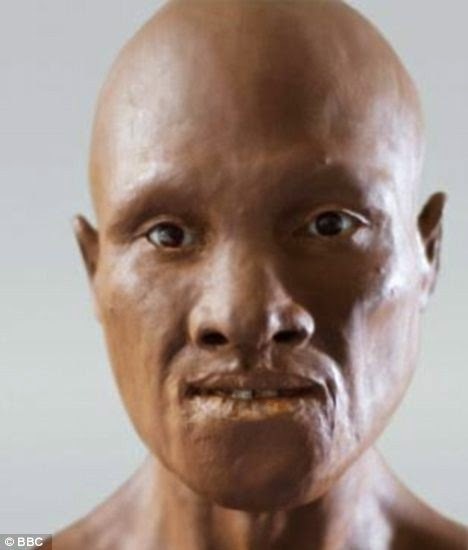 Reconstruction of early Upper Paleolithic in Europe based on a cranium from Romania which is 40,000 years old. He is known as the "first European". 2. 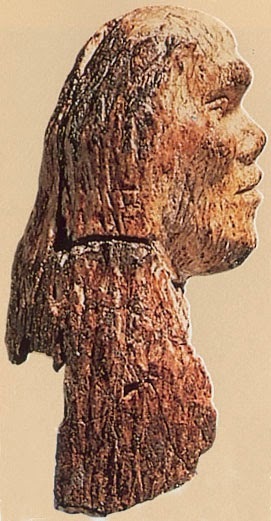 26,000 year old ivory head from Europe. Notice brow ridges, heavy jaw and wider nose. 4. 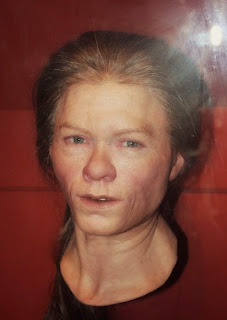 Reconstruction of Mesolithic hunter-gatherer, who is dated to 7,000 years ago and comes from La Braña-Arintero, Spain. Not known for certain whether eyes were blue; they know they were not brown, but possibly hazel or green. The skin is portrayed as brown. 5. Reconstruction of the 'Bäckaskogswoman' from Skåne, Sweden. She died between 7010 and 6540 BC. Basically, the narrative has been to manipulate Europeans into thinking they were not the ancestral people of Europe since the genes associated with white skin, and traits like ability to digest milk as adults, as well as tallness, were either brought into Europe by "immigrants" who arrived relatively recently or were traits that evolved much later than previously thought. Since the new research seems to say that the "original Europeans" did not evolve lighter skin soon after leaving Africa and arriving in the colder climes of Europe starting around 45,000 years ago, but remained African-looking through the most of the Upper Paleolithic period, it would seem to follow that current Europeans are a later epiphenomenon preceded by the true African founders. Most of us think of Europe as the ancestral home of white people. But a new study shows that pale skin, as well as other traits such as tallness and ability to digest milk as adults, arrived in most of the continent relatively recently. Apparently, not just North America, Australia, and New Zealand, but Europe too is not the homeland of whites. It was only after 7000 years ago that white skin "arrived" in Europe. Europeans have no right to complain about immigration-replacement by Africans and Asians. Before this scientific finding on the evolution of a white skin gene, it was assumed that lighter skin was a superficial trait that evolved gradually but steadily once Upper Paleolithic peoples spread in Europe, so that from the time they left Africa 50,000/60,000 years ago, to the time they colonized Europe, and steadily eliminated the Neanderthals, they evolved lighter skin some 40,000 years ago. Lighter skin, it was argued, was selected as a more efficient pigment for the synthesization of vitamin D from the lower UV light environment in Europe. 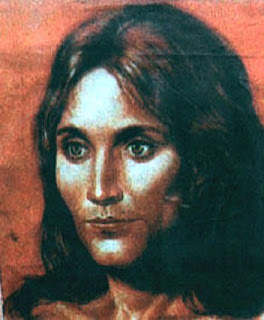 But now analysis of the DNA of a skeleton from La Braña-Arintero, Spain, dated 7,000 years ago (image #4 above), shows that it was from a male who had blue eyes but dark skin. The finding implies that for most of their evolutionary history, Europeans were not what many people today would call 'Caucasian'. Hear that? Europeans were not white for most of their history; the prehistoric inhabitants of Britain and Scandinavia, scientists are now saying, had a dark skin tone until about 5,500-5,200 year ago, but then their diets changed from hunting and gathering wild plants to the consumption of cereals, as farming was adopted, and this is what led to the rapid evolution of light skin. The new grain diet from farming lacked vitamin D, and so lighter skin was selected as a more efficient way to synthesize vitamin D from the sun. These dietary changes were brought by the spread of a farming culture which originated in the Near East. Whiteness was brought from Near Eastern immigrants to an otherwise Negroid European population. However, other articles were also informing us that genes for light skin, blond hair, and blue eyes may have evolved already among hunter-gatherers in north Europe before Near Eastern farmers arrived. Thus, an archaeological site in Motala, Sweden, dated to 7,700 years ago contained skeletons with genes for light skin, blue eyes, and blond hair. It was the inhabitants of central and southern Europe, it is argued in some science reports, who remained dark until Neolithic farmers from the Near East with a white skin gene colonized these areas with their farming technologies. This white gene was selected in Europe as the lower vitamin D grain diet from the Near East spread. All in all, the impression one gets from reading many of the articles announcing these findings is that whites are a blip in the annals of the genetic history of Europe, a temporary, rather late phenomenon in a continent that was inhabited by a people that were African-like through most of the continent's history. Can you not think of a reason Neave made it so dark? Are you not aware of the overwhelming moral compulsion that people in our society have to put the black race at the center of things, even to go so far as to claim that the early Europeans were African blacks? Mathilda equivocated without a clear response to Auster. There is no question the media used this reconstruction to put Africans at the center of European ancestry, with the British anthropologist Dr. Alice Roberts gushing over the reconstruction, and going to Africa to trace her ancestral roots, for a BBC documentary called "The Incredible Journey", which aired in 2009. Nevertheless, the fact that this early Upper Paleolithic inhabitant of Europe was black, and that white skin was a later evolutionary acquisition, actually supports our side of the debate. There has been biological change in humans since Homo sapiens sapiens left Africa some 50,000 years ago; the cultural Marxist view that human genetic evolution somehow came to a halt after Homo sapiens sapiens migrated out of Africa, as Stephen Jay Gould and Richard Lewontin argued, and as the entire establishment today continues to insist, has been falsified. Anthropologist Alice Roberts: I look at that face and think "I'm actually looking at the face of [my ancestors] from 40,000 years ago." The face Alice is looking at was neither the "first European" nor the first inhabitant of Europe. The Neanderthals (who evolved from Homo erectus, a species that migrated out of Africa over a million years ago) were the first. The early Upper Paleolithic people are best identified as the first Homo sapiens sapiens who settled in Europe from Africa via the Near East. It would take many thousands of years, under dramatically different ecological pressures in Europe, for these migrants to evolve into true natives of Europe. 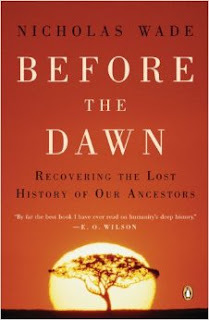 Now, Hart notes that while rapid technological changes occurred from the beginning of the Upper Paleolithic era, leading to the invention of sewing needles and cave paintings during the Aurignacian era, and of bow and arrow during the Solutrean era, most of the innovations occurred during the Magdalenian era, lasting from 18,000 to 11,000 years ago, such as harpoons fishhooks, spear throwers and pottery, when the average IQ had risen above 90. Were the Magdalenians the first Europeans? Of course, this is not how the media framed the second major finding about the genetic history of Europeans, namely, that a mass migration 4,800 years ago of pastoralists from southern Russia contributed up to 50% of ancestry in some north Europeans. To the contrary, it framed this finding in such a way that Europeans would be seen as a "mixed" racial group consisting of not only Upper Paleolithic Africans and Near Eastern farmers, but also of immigrants known as "Yamnaya pastoralists" from the Asian steppes. According to a BBC article, this "third ancestral group" of Yamnaya people should be "added to the melting pot" of ancient Europe. 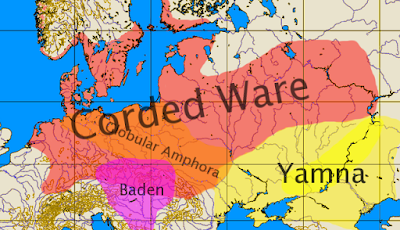 Now, if we just concentrate on the science of these findings, we learn both that a culture originally from southern Russia, the Yamnaya, contributed up to 50% of the ancestry of some northern Europeans, and that the lineage of the Corded Ware people, located in north-central Europe, existing around the third millennium, were genetically close to the Yamnaya population. 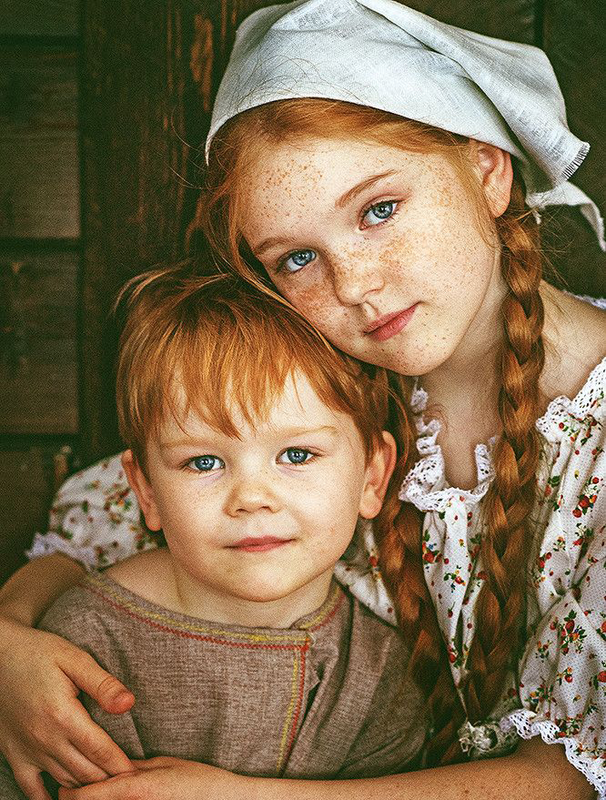 Roughly speaking, the genetic link between today's European population and the pastoral societies that migrated to Europe from southern Russia, or, to be more accurate, from present-day Ukraine, is around 50% of the gene pool in Northern and Central Europe, and around 25% in the Iberian Peninsula. Yamnaya people, that is Indo-European speakers, the legendary Aryans, who came to Europe starting 4,800 years ago, after this population had also evolved white traits. 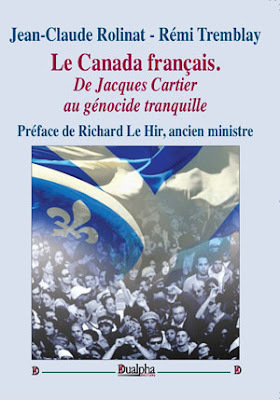 But it is not just the mainstream media that engages in deception, even scientific journals use cultural Marxist expressions; for example Nature, an "International Weekly Journal of Science", writes of Europe as a "melting pot" in which Near Eastern farmers encountered blue eyed hunter gatherers "who arrived from Africa more than 40,000 years ago", joined later by a "more mysterious population" of "Eurasians" (Yamnaya). Another article published in Nature in September 2014, a very technical paper authored by numerous scientists under the title Ancient Human Genomes Suggest Three Ancestral Populations for Present-day Europeans, did not even use the term "Indo-European" for this third ancestral population coming from Russia, but instead identified it as a population "related to Native Americans". However, a more recent study is more definite in stating that the "Caucasian" genetic traits of the Yamnaya population were original to the steppes, belonging to the European continent and the European race, rather than being of Near Eastern/Caucasian origin. This new study also distinguishes the Yamnaya-Corded Ware people from other European-derived populations from the steppes, such as the Sintashta and Andronovo, which migrated eastwards and were gradually replaced by people of East Asian ancestry or people who share ancestry with "Native American". Indo-Europeans were not "immigrants" and not a "mysterious" people who came from outside to join a European "melting pot"; they were instead a people that evolved in the Pontic-Caspian steppes, which is part of the European continent. There is evidence that the Indo-Europeans who moved into the Asian side of the steppes, both as Iranian speakers and as Tocharian speakers, into the Tarim Basin, were "fair-skinned and light-haired people," before they were replaced by Mongoloids. 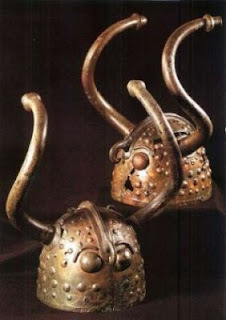 The Tocharians, a Caucasian people that expanded out into the Tarim basin,Western parts of China. They were an Indo-European people, with the standard fair skin and light hair. The oldest mummy, called the beauty of Loulan, dates at about 4,000 years old. Scientists today operate within a cultural Marxist world view which requires them to downplay any notion of racial whiteness and Europeanness. Since I don't submit to this ideological straitjacket, I am free to interpret these genetic findings as they should be. In my assessment of these findings I have benefited from a recent reading of Michael Hart's book as well as Nicholas Wade's Before the Dawn, Recovering the Lost History of Our Ancestors (2006), and Gregory Cohran's and Henry Harpending's The 10,000 Year Explosion, How Civilization Accelerated Human Evolution (2009), published before the above findings, but already incorporating genetic studies since 2003, when the full sequence of DNA units in the human genome was determined. Similarly to Hart, Wade really brings home the argument that human evolution did not cease at all after anatomically modern humans left Africa some 50,000 years ago. With their departure from Africa, the Upper Paleolithic gene pool was split into different branches in Asia, Australia, Africa, Europe, and then the Americas. Through the process known as genetic drift, and in substantial isolation from each other, and in response to different environmental pressures, these different branches evolved into different races. Although Wade writes generally about the emergence of new behavioral traits in the transition from hunting-gathering to farming societies, rather than about Europeans per se, he does write a bit about the evolution of white skin and in some detail about the emergence of lactose tolerance among the people of the Funnel Beaker culture located in north central Europe, which lasted from 6,000 to 5,000 years ago, or, if I may date it more precisely, from about 4100 BC to 2900 BC. He explains that the Funnel Beaker people's heavy reliance on the herding of cow and sheep eventually led to the evolution of a genetic trait known as lactose tolerance or the ability to digest milk in adulthood. This is a powerful example, in his view, of how culture, the culture of animal husbandry and dairy farming, not just the physical environment, causes genetic changes. Cochran and Harpending likewise reject the triumvirate claim of Montagu, Gould, and Lewontin that cultural change, not biological change, has been responsible for all the changes we observe in human lifestyles since 50,000 years ago, by explaining that not only has there been an "acceleration" in human evolutionary changes since the adoption of agriculture, but that the very culture of farming has been responsible for this acceleration in genetic changes. I might add that while the Funnel Beaker people are seen as non-Indo-European, their culture of dairy farming, as well as of wheeled vehicles, was fed into them by their more advanced Indo-European neighbor, the Late Cucuteni-Tripolye culture. It is also the case that the Funnel Beaker culture made a relatively fast and calmed internal change to the Indo-European Corded Ware culture at about 2900 BC. Speaking of which, Cochran and Harpending think that what gave Indo-Europeans an "edge" in their ability to expand across Europe and into the more advanced cultures of Anatolia, Mesopotamia, Iran, and India, was the higher frequency of lactose tolerance among their population due to their culture of dairying pastoralism. Using cattle primarily for milk is more efficient than for raising cattle for slaughter; it "produces five times more calories per acre" (p. 181), and thus the ability to raise and feed more warriors per acre. Better nutrition also produced Indo-Europeans that were on average taller than people relying on grain farming without dairy products. I would also argue that the life-style as a whole of the Indo-Europeans, the riding of horses, wheeled vehicles, their intense use of animals for multiple purposes beyond farming (Secondary Products Revolution), their bold nomadic lifestyle, their mobile, wagon-and tent-based herding economy, all these factors combined, together with lactose tolerance, as well as their emphasis on individual renown, daring, and heroic pursuit, staged in the harsh and highly competitive environment of the steppes, left their imprint on the genetics of Indo-Europeans, producing personality traits, such as a greater willingness to take risks and to act as individuals. But this is an argument that is far more difficult to proof scientifically than the emergence of lactose tolerance, and which thus awaits further research. Immigration might be a hot topic in the current general election campaign, but it's certainly not a recent trend. What it shows is the extraordinary stability of the British population. Britain hasn't changed much since 600 AD. The genetic signature of the Viking invaders was restricted to Orkney; and there is also little Roman DNA in the British gene pool. So much for mass migration movements into Britain. We are an ancient people, and though the Isles have been the target of invasion and opposed settlement from abroad ever since Julius Caesar first stepped on to the shingle shores of Kent, these have barely scratched the topsoil of our deep-rooted ancestry (p. 287). The strongest genetic signal, the substructure, is Celtic, followed by Anglo Saxon, and some Viking traces; Roman "genes are very rare in the Isles". Be it noted that the Celtic ancestry of Britain is connected to the Indo-European folk movement out of the steppes, and directly to the Bell Beaker culture (2700-2000 BC), which spread over a large area of Europe, and is presumed to have spoken a Proto-Italo-Celtic language. The Bell Beaker culture brought the Bronze Age to the Isles around 2400 BC, and there melded with the descendants of the hunter-gatherers who had come back to Britain after the last Ice Age 12,000 years ago. Likewise, the Angles and Saxons who colonized Britain around AD 400-600 came from the Proto-Germanic Corded Ware and Bell-Beaker cultures that had melded during the Nordic Bronze Age (1730-760 BC) in Jutland, or what is present day Denmark, and the coasts of Norway and Sweden (where they had in turn melded with the descendants of the Funnel Beaker and Ertebolle cultures). There are multiple historical studies showing that the populations of northern, central, and western Europe, have experienced minimal migratory movements from outside Europe, apart from some specific locales in the south, such as in Sicily, southern Italy, southern Greece, and southern Spain; and in the east, such as in Romania and Hungary. Mass immigration into Europe is a phenomenon of post WWII promoted by our current traitorous elites. The elites in charge of our precious heritage have no qualms lying and misusing science to promote white genocide. Don't believe anything these propagandists say. Europeans evolved in the course of time inside Europe and have remained European through almost their entire history.